All friction top metal cans and many plastic containers to a maximum diameter of 7.5 inches (19cm) may be closed on the FTC machine. The conveyor travels at approximately 30 ft./min. ( 9m/min. ) and will accept randomly placed containers. The machine is shipped assembled and may be installed quickly and easily by your plant personnel. 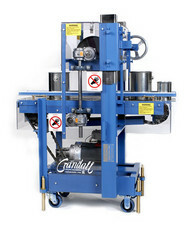 Conveyor height is manufactured to your plant specifications. A fractional horse power motor is provided in customer electrical specifications to operate the closer. The lid is placed on the container before entering the machine where it is conveyed below the synchronized powered roller and sealed. To change the height of the closing wheel simply adjust the rack and gear system using the adjustment wheel. Most adjustments and repairs are not difficult and may be made by your plant personnel. Sturdy welded steel construction will provide many years of profitable service. Polycarbonate guards covering moving components. Motor is Class 1, Group D, Explosion proof. UL and CSA approved. No operator needed at the machine while it is in operation. The operator at the filler normally places the lid before discharging the container to the FTC. 5.5 amps., maximum depending on motor electrics. Special: Automatic lid dropper for pints, quarts and gallons.